Cloves are native to the Maluku islands in Indonesia. They now come from Madagascar, Indonesia, Sri Lanka and Brazil. Cloves are the rich, brown, dried, unopened flower buds of syzygium aromaticum, an evergreen tree in the myrtle family. During the 13th and 14th centuries, cloves were transported all the way from Indonesia to China, India, Persia, Africa, and Europe. During this time, cloves had a very high price, thus wars for monopoly over the cloves production and distribution began. Today, cloves are a very important commercial crop all around the world. 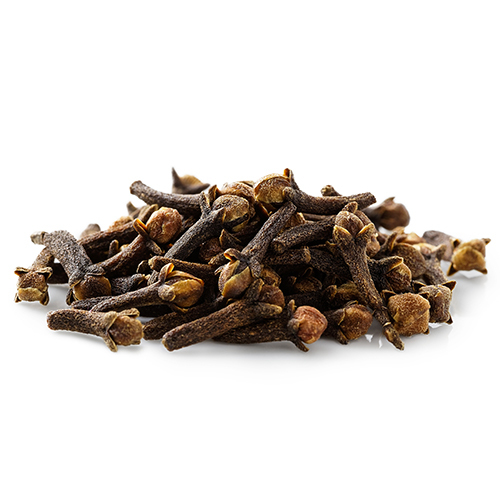 Cloves are herbs and can be used whole or ground, with a very strong, pungent flavor and aroma. However, even when cooked, whole cloves have a very hard, woody texture that may pose a physical hazard if biting it to it unnoticed..
idays, think eggnog or pumpkin pie spice. Many food recipes that include cloves also include spices such as cinnamon, nutmeg, allspice, vanilla, citrus peel, star anise or peppercorns. Cloves are actually the result of the harvest of dried unopened flower buds. A Clove tree starts to flower after 6 years of its planting if grown in favorable conditions. However, it takes at least 15 ”“ 20 years to reach the full bearing stage. Cloves require humid tropical or subtropical climate. Harvesting is done when the bud turns deep pink and that color is almost up to the rounded part of the bud, then it is picked and set out to dry, all the while being careful not to damage the branches.